It’s difficult not to love days like today. True, I don’t want colder weather and definitely not winter. But, the leaves that remain on the trees are beautiful golden against the sun, the air smells lovely, and I simply feel an overall calm. While the season continues to wind down, we are still busy at home and at the farm. The green tomatoes we rescued and have stored downstairs are turning red daily. I made my third batch of tomato sauce from them today and probably have another couple stock pots over the next few weeks. My freezer bag of veggie scraps was getting full, so I made a nice vegetable stock which is now bagged and frozen. Plus, I cooked up a double batch of Lamb & Kale Stew which is also in the freezer. 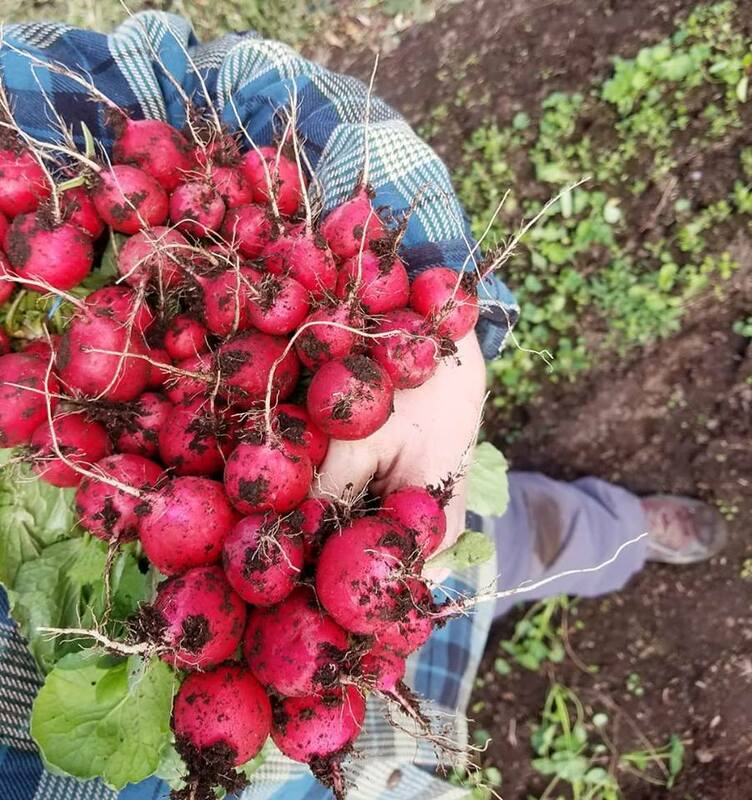 At the farm, we are still tending to arugula, broccoli, radishes, carrots, celery, kale, parsley, the last of the leeks, and some high tunnel mini romaine and kohlrabi which might be ready this weekend. We have also planted the garlic for next season and will plant the Jerusalem artichokes next week. At market, we are having a Biggest Pumpkin Contest this Saturday. Judging will be at 10am and the winner will receive a prize from B&G Produce. Bring your pumpkin to the Market Manager booth to register! Grab a coffee and muffin from hummingbird as you stroll through market. BLC Ranch has wonderful wool items to keep you warm during the coldest months. Check out the hat I’ve been wearing the last few weeks. Stock up on jerky and back-on-the-shelves chicken snack sticks at Bad River Pack! Then, stop at B&G Produce for some rustic bread, hummus, and produce. They will have a sale on Pea Shoots and Winter Squash. Plus, potatoes are back!! Although this is the last regular season market, many of us will be at Zonta on November 10-11 and we also have our special Thanksgiving market on Saturday, November 17. Plus, we will have monthly off-season markets again this year. Look for updates via email, Facebook, and Instagram. Be sure to Like us on Facebook @capcityfarmersmarket and Follow us on Instagram and Twitter. You may also follow our website for weekly updates. If you know anyone interested in selling produce, baked goods, meat/poultry, eggs, or craft items, please have them visit our website, call or email Julie Bolding at 224.4348 or juliebolding@yahoo.com.